Verify solder joint reliability at a fraction of the cost with the new Metcal CV-500. Want to harness groundbreaking Connection Validation™ technology for less? Luckily with Metcal, good things come in small (and more cost-effective!) packages. With a modest footprint and efficient design, the all-new Metcal CV-500 was designed for SMD touch-ups and small component rework — plus all the enhanced solder joint reliability that only Connection Validation technology affords. Connect with All-Spec for more information on the Metcal CV-500. Simply complete the form below and we’ll be in touch. 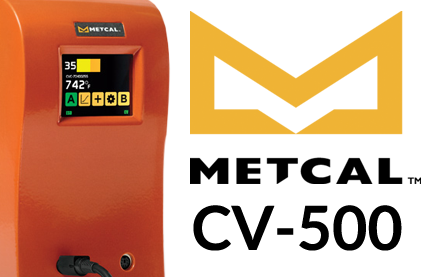 Why Choose the New Metcal CV-500? An industry first, Metcal’s patented Connection Validation technology represents an evolutionary step forward in soldering process control, delivering real-time, closed-loop feedback. Via an integrated green/red handpiece indication light, Connection Validation technology confirms a solid intermetallic compound formation — thereby validating a good solder joint.